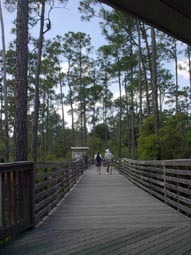 Here starts the boardwalk trail. This first section takes you through a Pine Flatwood. 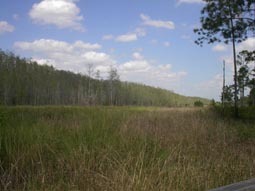 The only pine species found at Corkscrew is the Slash Pine. They are 100 to 200 years old ! 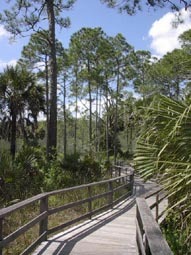 Other common plants found here are the Cabbage or Sabal Palm and Saw Palmetto. 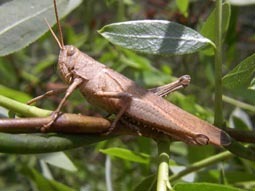 This locust was in a small bush next to the boardwalk. Up ahead we start to see the Pond Cypress Stretch. The stretch seems to go for miles. 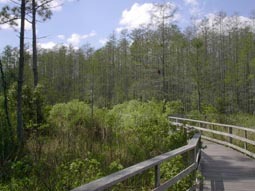 This begins the Pond Cypress Area.